A crown is a versatile treatment option that helps to strengthen teeth when they become weakened due to decay or injury. They also limit further damage from affecting the tooth. 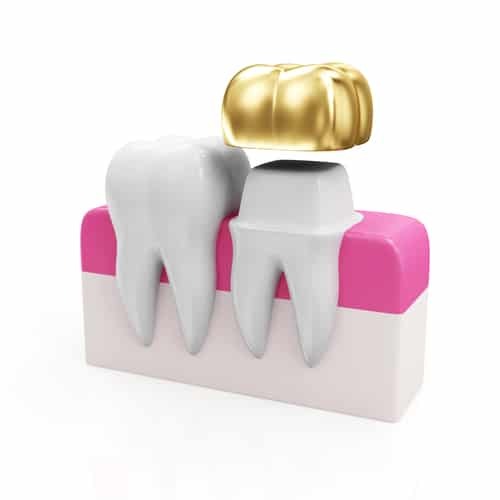 Crowns are sometimes called caps as they are placed over the top of natural teeth, designed to strengthen the visible part of the tooth. They are aesthetically pleasing and blend in with surrounding teeth. The outside world won’t even be able to tell you have a crown. They are stain-resistant and durable, meaning the financial outlay is money well spent. They allow full-function of the tooth, so your tooth is restored to its former state, without compromise. By restoring function to your mouth, you protect your remaining teeth and reduce the chance of having to undergo further dental treatments in the future. Apply a local anaesthetic and file the tooth down to make room for the crown. We will then make an impression of your tooth and send it off so that a specially tailored crown can be made. Give out a temporary crown to protect the tooth in between appointments. Check the fit and shade of your crown. Once you’re happy with the colour and the fit of your new crown, we’ll give you a local anaesthetic to numb the entire area. Then, finally, your new crown will be cemented into place.